The EPA’s response only made matters worse. In August, Hurricane Harvey made landfall in southeast Texas as a Category 4 storm, bringing with it catastrophic winds and 33 trillion gallons of rain, which caused deadly flooding in the Gulf Coast region of the state and around the Houston area. The record breaking rainfall also brought another problem: Toxic pollutants in vulnerable communities. There are 82 Superfund sites—EPA-designated areas that have been polluted with toxic waste and chemicals—in 13 counties affected by Harvey. According to the Center for Biological Diversity, a nonprofit conservation organization, 73 percent of those sites are located in communities that are predominantly low-income or homes to people of color. Of the 16 Harvey-affected Superfund sites reported flooded by the Environmental Protection Agency and the Associated Press, nine are in neighborhoods where the majority of the population is of color, low-income, or both. Residents are worried that flooded sites could spread toxic waste to their homes and neighborhoods. The Highlands Acid Pit in Highlands, Texas, about 20 miles from Houston, was designated as a Superfund site in 1982 and was flooded by Harvey. According to the EPA, in the 1950s the pit received an unknown amount of industrial waste that the agency believed to be sulfuric acid from an old oil and gas refinery. The chemicals have since seeped into the soil and the ground water. The site has flooded at least once before in 1961 during Hurricane Carla. Today, the area is home to thousands of people—some whose families have lived there for generations. The Highlands Acid Pit is not an anomaly. 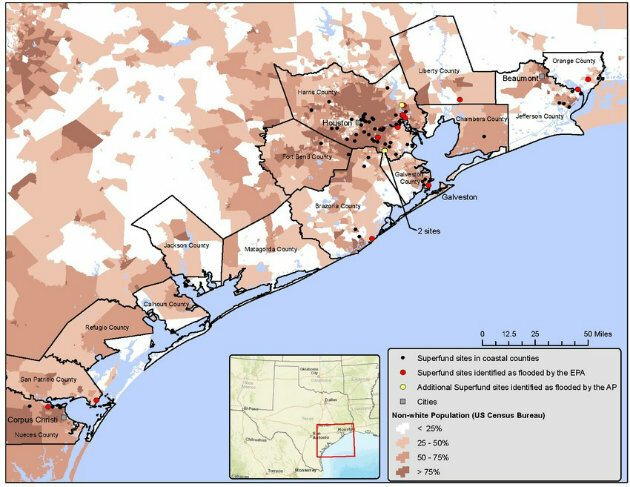 Harris County, home to the city of Houston, has 50 Superfund sites alone. 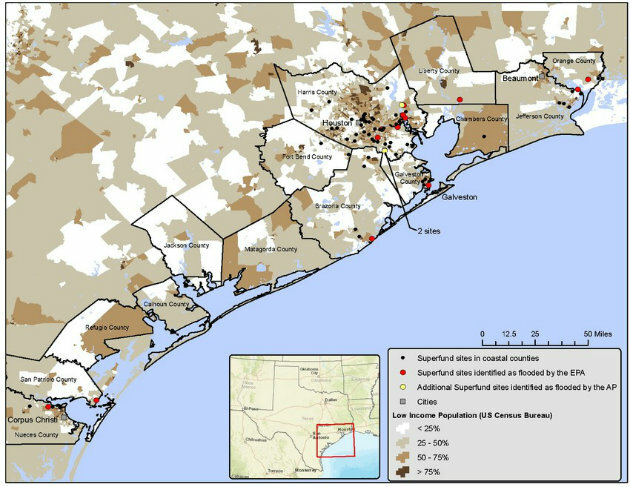 In Harris County, neighborhoods with Superfund sites are, on average, 79 percent nonwhite. A map showing where non-white populations are concentrated. On average, 42 percent of the population near Superfund sites is low-income. A map showing where low-income populations are concentrated. The EPA has been taking the heat for responding slowly to the communities living near flooded Superfund sites. Last week, the Associated Press reported that while its own journalists used boats to access some of the flooded sites, the EPA had not yet been to some of the sites . After the story was published, the EPA released a bizarre statement that called the story “misleading” and personally attacked one of the bylined reporters. In the wake of Harvey and Hurricane Irma, which is poised to make landfall in Florida some time on Saturday, EPA head Scott Pruitt said that now isn’t the time to discuss climate change, despite the role it’s playing in these storms.